You can import contacts on the HubSpot mobile app from your device contacts or with the business card scanner. Please note: device contacts with no email addresses cannot be deduplicated or associated with companies. In the bottom navigation menu, tap Contacts. In the upper right (iOS) or lower right (Android), tap the + icon, then tap Import from contacts. In the Allow HubSpot to access your contacts? prompt, tap Allow. 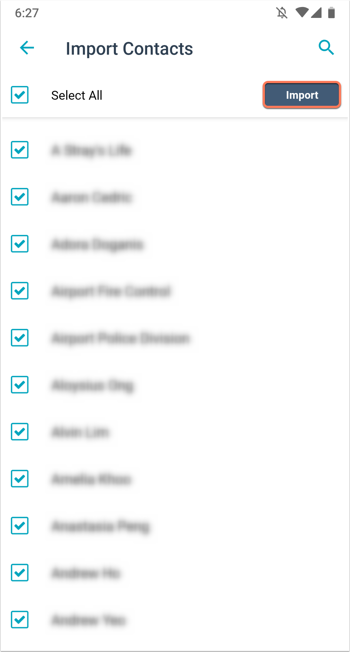 A list of contacts on your device will appear. Tap the checkbox(es) next to individual contacts, or tap the Select All checkbox to select all the contacts on your device. In the dialog box, tap OK.
You'll be redirected to the Contacts screen, with a message Your contacts are importing... (iOS) or Processing contact import... (Android). After the contacts are imported, a message x contacts imported. Your contacts have been saved to the app (iOS) or Successfully imported x contacts. Refresh to see new contacts (Android) will appear. You'll also receive an email notification that the contact import is complete. Please note: contacts imported from business cards before October 10, 2018 will not have the Original source drill-down 1 or 2 property values. 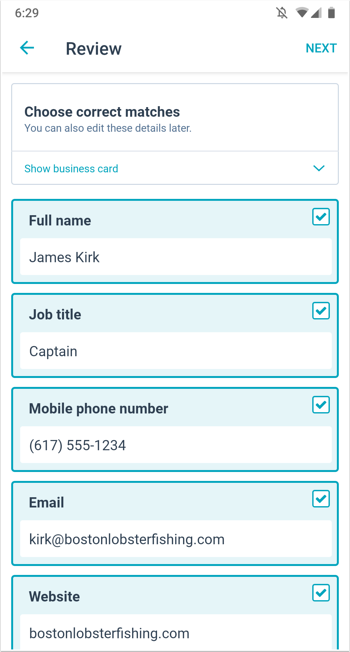 The business card scanning feature is available on Android devices and iOS devices running iOS 11 or higher. Please note: the business card scanner is not supported on iPads. In the upper right (iOS) or lower right (Android), tap the + icon, then tap Scan business card. In the Allow HubSpot to take pictures and record video? prompt, tap Allow. Take a photo of the business card with your device. Make sure there's adequate lighting and there isn't any severe glare or blur. Tap and drag the four points to define the edges of the business card. Tap the properties that are a correct match. If any of the values are incorrect, they can also be selected and edited in the next step. In the top right, tap Next. Review and edit any incorrect properties. In the top right, tap Save. You'll be redirected to the newly created contact record, with a message Contact saved. To scan another business card, tap Scan another card.